When we moved from a 100 year old storybook cottage to a seven year old house in a subdivision I was faced with trying to recreate some of the exterior charm I had traded in for the opportunity to live on the water with closet space and a real basement. The first thing I did was paint the brick which made a huge difference. However, if you are trying to move into a home that requires less maintenance this may not be an option. So I wanted to share some suggestions on how to achieve a more charming exterior in ways that do not require a complete exterior paint job. Charm means different things to different people, but for me a charming home is one with added details that give it a sense of history, a sense of purpose and place - not something that has been plopped in a pasture with several homes that are almost all exactly the same. The following are a few ways to add unique details that, in my opinion, will add charm to any home. Landscaping is something that is often thrown together at the very end of a new build without much thought. By the end of the project the budget is depleted and “get-er-done” mode has kicked into high gear. Revamping your yard with a well thought out plan will do wonders. So many new homes lack symmetry. Symmetry and simplicity are pleasing and calming to the eye. Therefore, editing or revamping your front beds can make a huge difference. In addition, I suggest using plants that you would find in established yards such as boxwood, hydrangea, roses, climbing roses, autumn ferns and lenten roses just to name a few. Keeping the color scheme simple will also help it appear more thought out and less chaotic. This plan by Stuart Row is what we used for the front of our house. It not only made the front of the house more charming, it made it much easier to keep tidy and manicured. Boxwood, roses and peonies are staples in an established yard. Add some treillage to your exterior! Nothing adds charm and a sense of history like climbing roses or manicured ivy growing up a trellis or on your chimney. 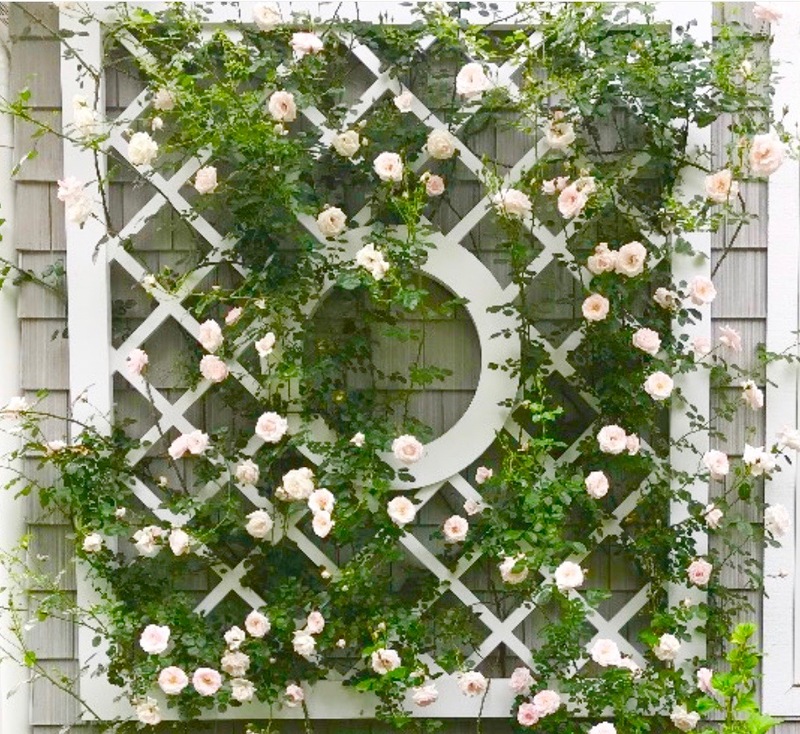 A beautiful trellis, like the one in the opening picture of the post that was created by Stephen Hackney can add charm and architectural interest. You can read my post on how to build the one pictured below here. This is one of my favorite things that we added to the exterior of our house when we moved in. Pictured above is Carolina Jasmine growing up our chimney. We simply attached some copper wire to the chimney and the vine took over from there. A landscape design by Keith Williams of Nievera Williams Design. I love to find ways to integrate unique ironwork, fretwork or railings. They add personality and architectural interest. An entryway to the bakery at Magnolia Home in Waco, TX. Photo of a home with beautiful fretwork railings via Anne Wagoner Interiors. A charming little cottage at Blackberry Farm. Garden statuary instantly adds a sense of history and personality to your landscape. We moved this old garden pig from our last house. Be sure to check out the garden frogs in a photo in the awnings section below. Consider upgrading your exterior lighting and hardware. This is another place contractors can save money by installing big box store options. This is something I haven’t changed on our house yet, but it is high on my list. Usually contractor grade lighting is smaller in scale. Try larger, but more streamlined fixtures. Think less fluff and more presence. 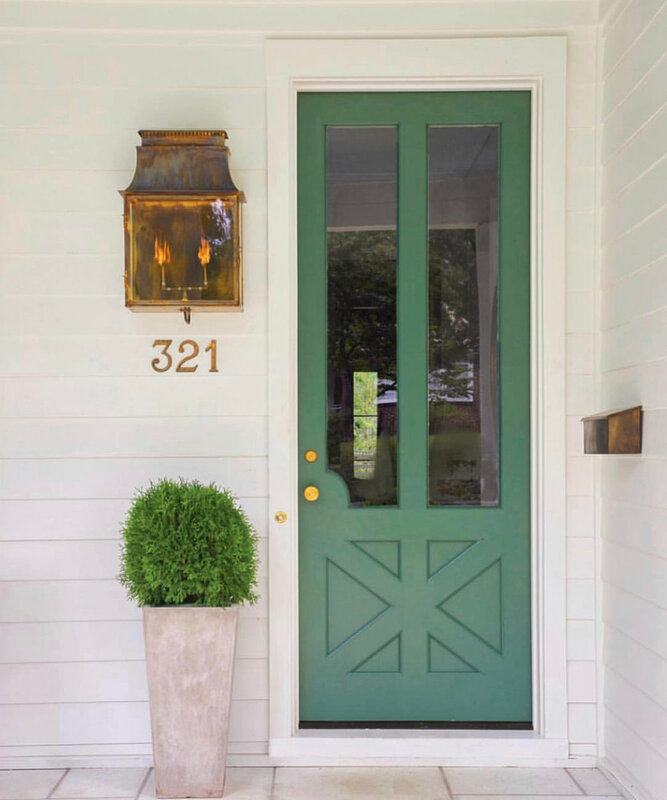 Also adding new door hardware, house numbers or a door knocker can be another way to inject some personal style. Consider adding a water feature. Nothing beats the calming sound of water. We installed this one in front of our front porch. 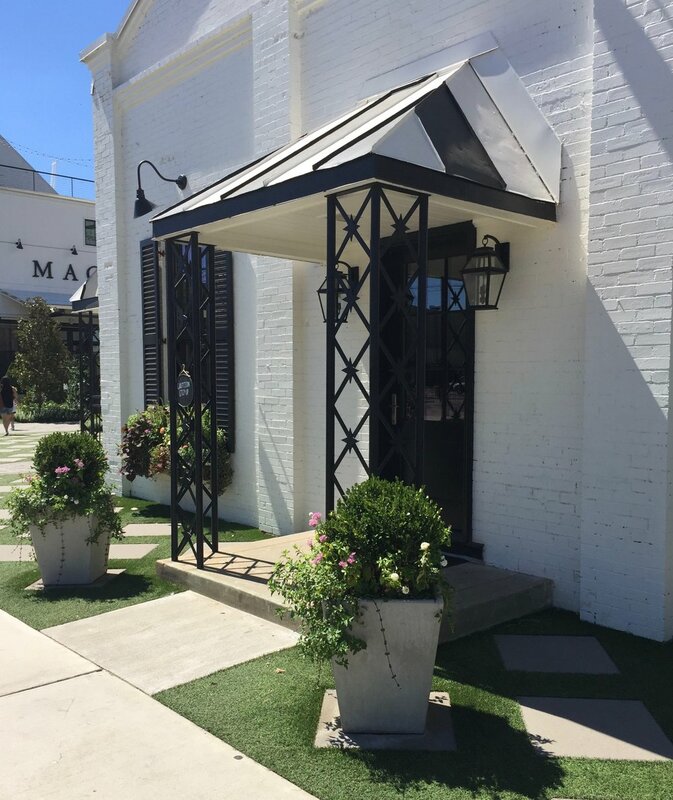 I love an awning for adding color, personality, presence and shelter to an entryway. I apologize for not knowing who this is or who took the photograph. I just love the charming awning, ironwork and garden frogs so much I had to share! This outdoor drapery serves a privacy screen as well as sun shield. A classic Lutyens bench like the one pictured above from Restoration Hardware is an excellent option. 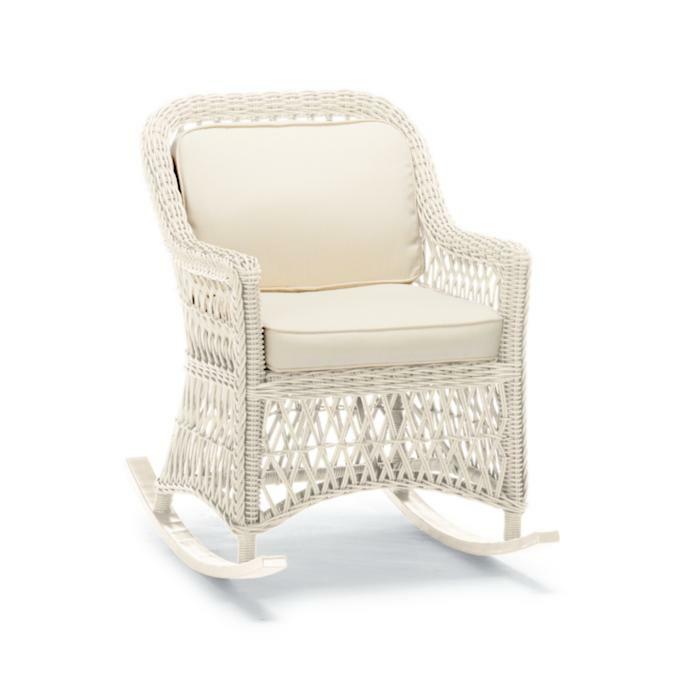 It’s hard to beat the comfort and charm of a classic wicker rocker like this one from Frontgate. If you are looking to add some charm to your exterior I hope I have given you a little inspiration. Thanks so much for reading.